Won't post month for the next week or so due to the fact that we are out in the desert with the family. I hope you had an incredible christmas and have found some time to relax, reflect and rejoice. We didn't have junior high or high school ministry programs this weekend due to our church-wide Christmas services, so I have no wrap up to report. But, I am working on a fun little 'bit' for next weekend and thought we could all contribute and all have something fun for our next Junior High service. I want to create a silly Top 10 list. Here's the List: "TOP 10 MOST RETURNED CHRISTMAS GIFTS OF 2008"
The list needs to be completely goofy. Add as many as you want and then we can all pick and choose the ones that work for us. - "Official Belly-button lint from a guy who went to junior high with a girl who knows the Jonas Brothers"
- The 2009 Kurt Johnston swimsuit calendar (insert name of appropriately funny guy from your group). As you can see, I need help. But maybe we can create a funny bit we can all use. - Sitting in the coffee shop I have a perfect view of the snow atop our local foothills. It happens once or twice a year and only stays for a couple days so it's a fun treat for the eyes. It could also be a fun treat for the body if one is willing to hike about three hours as there is no access for vehicles. I'll enjoy it from a distance, thank you. - To be honest, I'm really shocked at how much outrage/controversy/firestorm Rick Warren's invitation to participate in Obama's inauguration has stirred up....mostly from those on the left who feel somehow betrayed by Obama. That they don't understand politics, and that's exactly what this is, confuses me. Every President has a pastor give an invocation, and to ask Rick Warren who represents the faith of such a large number of Americans is a savvy political olive branch for Obama to extend. I'm constantly amazed at how intolerant those who holler for it the loudest often are. Plus....me likey Rick Warren. - Tonight we have our Christmas edition of "The 3" which is our monthly Junior High outreach night. We've got pictures with Santa, Christmas Carolokee, A Christmas Scavenger hunt, A "snowball fight" and more planned. Should be fun. - The countdown has begun for our annual dirt-bike trip to the desert (Ocotillo Wells) the morning after Christmas. We go riding several times a year, but this is always our longest trip. The only dilemma so far is that I promised a friend he could use my bike (he's thinking about buying it) because I was supposed to have my new one by the time we leave. Right now, it looks like I won't have my new bike and I don't want to break my word to my friend so I'm bikeless! BUMMER. - Each year I try to read a new fiction book on the trip. I rarely read fiction so it's usually the only one I read all year. Any suggestions? 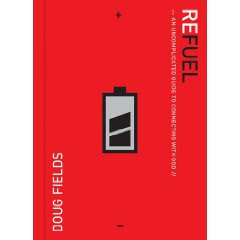 Yesterday I grabbed a copy of Doug Field's new book, Refuel. It's a short read that is really long on practical insights into the struggle all Christ followers face: staying connected to the Father. As far as I know, this is the first book Doug has written to a non-youth ministry crowd. Doug's usual wit and wisdom that has, up to this point, been reserved for us youth workers is dripping through this book. It's cheap and small which makes it a perfect stocking stuffer or a great book to put in the hands of a friend. This past weekend was one of our best in a long time. We had it packed with music, fun programing and a really good message. BUT, it was also a tough one. For some reason we just couldn't dial it in. My message was good one service, but not the next. A game was well received by one crowd but not another etc. It was really a roller coaster weekend. The highlight of the weekend may have been two first-time students who came in late, missed all the "fun" and only got to hear the lesson. One of our volunteers overheard them talking on the way out about how much they liked the lesson and how much it made them think. Very cool. MUSIC: Music this week was really good. We sang Christmas songs and had two special numbers that were led by soloists...one by a 7th grade girl and one by an 8th grade girl. We had 5 songs which is more than usual but it flowed well. FUN & GAMES: Another round of "Jaime I Help You?" went pretty well. This week he recycled diapers to make a diaper wreath and used a pickle jar to make a funny snow globe. We showed a video comparing/contrasting Jesus and Santa which was actually pretty powerful, a crew of our team did a fun rip-off of an old SNL Christmas song bit, and we played a game in which students bobbed in eggnog looking for candy canes. ME: "Kayla, I'm thinking that hanging out there on a Friday night probably isn't such a great idea. that place just seems to attract the super rowdy crowd. KAYLA: "True, but they are the same kids I go to school with every day." ME: "True, but at least at school they are forced to be somewhat under control." KAYLA: "Have you ever seen my math class?" Classic. But the funniest part to me is that out of all her classes it's the MATH class that is rowdy! - My dad's burial at sea was overwhelmingly beautiful. A group of about 40 of us spent an hour on a chartered boat and right at sunset we released my dad into the water surrounded by a host of roses. It was a powerful moment. - What was without question the busiest 6-month ministry season in my career is finally headed to a slowdown. Things feel like they may be back to normal (although "normal" seems to have a new definition....the old normal is gone) after the holidays. Despite the craziness, the past 6 months have been an amazing journey, and our student ministry team is stronger and more unified than ever before. - A few posts ago, I asked readers to contribute their teaching strategy and "plans". Thanks to everybody who posted comments and shared their insights. I am committed to thinking this through and being more purposeful (Shout out to Rick W.) in my approach to the educational part (and, as we all know formal education really is only a part of ministry to young teens) of our ministry. - Had a heated, and admittedly biased, debate with a cowboy fan concerning this topic: If you were to start an NFL franchise tomorrow, who would you pick for your quarterback....Tony Romo or Jay Cutler? Those are the only options. I am probably arriving a little bit late to the party due to the fact that technological stuff usually isn't on my radar until somebody else puts it there. So, at the risk of being "so last month", I want to point you to Xobni, a super cool application that helps you retrieve emails, track conversations etc. It really is pretty sweet. Mood Management? Ministry By Mood? Moody Leadership? This may be the first time I've admitted this publicly (but most people who know me know this is true...even if I've never really proclaimed it), but I have given up on the concept of time management. My ministry world simply spins too fast, has too many variables, is too unpredictable and relies on other people far too much to hold a hard line when it comes to scheduling my time. Of course I still plan my week and make a list of tasks, meetings, projects etc. that must be accomplished, but I rarely force those items into a neat little time slot on my calendar. What I've learned about myself over the years is that I can be rather "moody" from day to day. I'm not talking about grumpy, feisty, short-tempered etc. but moody when it comes to the various roles of ministry. Some days I "feel" creative and other days I "feel" a bit more reflective. Some days after lunch I feel like tackling some tough issues and other days after lunch I feel like tackling a pillow! There I times when I am just simply in the mood to spend time with a volunteer or two and there are times when I am in the mood to work on the budget. Sometimes I'm in the mood to write and sometimes I'm in the mood to read. Because this is how I'm wired, I've decided to quit feeling guilty about being a poor time manager. For example, the pressure to write my lesson from 1:00 - 4:00 every Wednesday afternoon is paralyzing to me so I no longer schedule my lesson writing time. I know that my lesson has to be complete by Thursday afternoon so I will write it any time before then that I "feel" like writing a lesson. Of course there are ALWAYS things that I don't feel like doing, that I'm not in the mood for, that have to be done and for those things I force myself to fit them into a time slot on my schedule so they aren't neglected. The upside to this strategy: I feel like I am usually doing projects and working on things that feel important, engaging or satisfying at the moment. The downside to this strategy: It can be frustrating to those I work with who do appreciate tighter scheduling or rely on me to meet deadlines of their own. Those who work close to me have learned to give me deadlines that are firm, but far enough away to allow me flexibility. I'm sure, as is the case with so many things, there is some sort of really good compromise. I would imagine that the most productive people are those people who are good at, and committed to, proper time management but are also flexible and can adjust whenever they need or want to...I'm just not in the mood to try to figure that out! MUSIC: Music was lead by a combination of junior high and high schoolers this weekend. All but one song were Christmas songs. Personally, I don't love doing Christmas songs too far ahead of Christmas, but the students were totally engaged. FUN & GAMES: We played a "nativity quiz" game that tested student's knowledge of the Christmas story...what is actually in the scriptural account and what is folklore. We also showed a fun, animated video that went along with the game. Jaime, who runs our weekend program, did a fun bit called "Jaime I help you?" in which he demonstrated how to make cheap and easy Christmas gifts and decor. This week he made a "toilet paper tree topper" which as an angel like tree topper made from toilet paper and his own version of fruit cake which was a cake with a ton of fresh fruit crammed into the top. Think food network meets really bad humor. LESSON: We started the lesson by showing about 7-minutes worth of various scenes from "A Christmas Story"; specifically around Ralphie's pursuit of his perfect Christmas gift....The Red Rider BB Gun. I then taught a lesson called "The Perfect Gift" which focused on the fact that Christmas really is about a gift....A perfect gift. I then talked for a few minutes about God's gift of forgiveness of our sins through Christ etc. I talked about how weird it would be to get a gift at Christmas and then be asked for partial payment or to do chores to earn it etc. I asked students to think back to Christmas of their fourth grade year. What did they want? Can they even remember what they wanted? Do they still have it? etc. Our attendance was a little bit higher than usual for this time of year. Volunteer involvement was good, but we didn't utilize them in our program as much as I would have liked. Over all, it was a really good weekend. YouTube is creating some new rules and operating procedures in an effort to minimize the exposure of questionable videos and content. This feels like really good news since it is one of the most-visited sites by young teens. Read more about it here. I've been thinking a lot lately about the importance, or lack thereof, of a strategic year to year teaching plan. In our ministry setting, if a junior higher enters our ministry as a 7th grader he/she will have approximately 100 weekend lessons and somewhere close to 60 small group bible study lessons under their belt by the time they graduate from 8th grade. Of course this assumes they are involved in a small group and rarely miss either small group or weekend programs. Sooooo, with at best 150 (add 33% if you have 6th graders) opportunities to speak God's truth into the lives of a group of students who are in the midst of CRAZY social, spiritual, emotional, physical and intellectual development, it seems like junior high ministries should have a pretty solid christian education plan, right? It does to me, but we don't. Our team recently had a small, but rather disturbing, "ah ha" moment at our weekend program that caused us to acknowledge that perhaps we need to become more proactive in thinking through our teaching scope. Sure we have certain areas of studies that we make sure we cover from year to year such as the basics of the faith, sexuality, core doctrine, etc. but honestly there isn't all that much that has been deemed as "stuff we always teach to every group of kids". So this post is selfish, but hopefully one that will garner some discussion that will benefit everybody. - How do you balance felt need/topical with expository/doctrinal type teaching? - If you have small groups, do they follow your weekend lessons or stand alone? - Is it better to expose this age group to lots of topics or pick much smaller amount and repeat, repeat, repeat? - Given their developmental stage, how much time should we spend helping them navigate this season of their life? - Knowing that much of our faith is more 'caught' than 'taught', what types of strategies do you employ outside the formal teaching time to help students 'catch' a desire to follow Christ? Okay, that's enough...I really could go on and on. Let's talk! - Hey! my last post was #650! I probably should have done something cool commemorate it. - Starting next Monday, I will bring back the popular "Weekend Wrap Up". I would have brought it back today but I wasn't part of our junior high programs this past weekend so I have nothing to "wrap up" other than I heard it was a great weekend. - If you happen to ride a dirt bike, what do you ride? Do you recommend one bike over another? Is there one to avoid at all costs? I ask because I am in the market to "move up" from my 2002 Honda XR 250 which I bought at a killer deal from a buddy as we were getting into riding. Now that it is something that has "stuck" with the family we are in the process of upgrading some of our bikes. And conveniently, I'm first in line!